Final Fantasy XIV: A Realm Reborn has been out for a couple of months now on the PlayStation 4, and even longer if you’re playing on the PlayStation 3 and PC, and I’ve been swept in the hype. Square Enix mentioned that the game has sold upwards of about 2 million units, calling it a success on all fronts, and its developers have been checking out people streaming their game on the PS4. But I know what you’re saying: What makes this game different than most MMOs out there? That was one of the questions I wanted to answer by subscribing to the game and I’m thankful that I took the plunge. And while I won’t go into some of the finer nuances of the gameplay, I wanted to reveal some of my personal revelations about what makes this MMO truly special. That being said, I’ve written this editorial with the intention that MMO players who may have strayed away from the genre would find reason to perhaps try this game. Of course, if you’ve avoided MMOs, I’m hoping you’d be swayed as well, even for a little bit. 1. The game rewards you for grouping with people. For some reason, developers of MMOs thought that by partying with someone who’s more than several levels from you that it would make it easier for players to power level themselves to max level. These same developers forgot, however, that no matter how much protection or enmity that high level players would try to drive away from low level players that monsters can still one shot them and prevent them from having any meaningful progress. 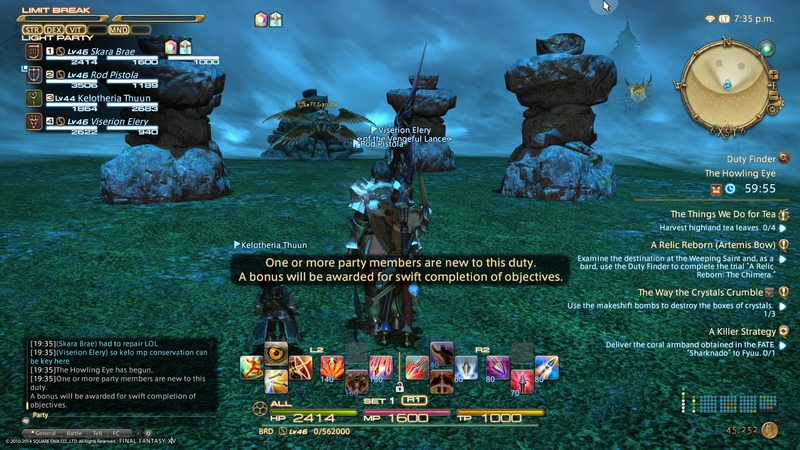 It seems as though the developers of Final Fantasy XIV: A Realm Reborn realized this and allow you to party with practically anyone, regardless of the level, and seemingly without penalty. But why would high level players want to even party with low level players to begin with? Read on and I’ll tell you. Helping a low level player out, especially if it’s their first time undertaking a quest, is a good way to get bonus experience and gold. 2. You don’t ever need to buy bags. Ever. In most MMOs, the idea of having storage is a pretty big deal. So much so that it’s a commodity and typically part of the gameplay loop. Coming from Final Fantasy XI, which didn’t have a limited inventory system, made me wonder whether or not Final Fantasy XIV: A Realm Reborn would implement something similar. Lo and behold, they don’t require you to make or buy bags in this game at all. Out of the gate players immediately have access to 100 inventory slots, which does not include separate dedicated slots for each of the pieces of armor and weapons you carry as well as storage for any key items or crystals (for crafting) that you’ll be needing later. This also does not include the 200 slots you get for each retainer (you get 2 for each character with your subscription) and the slots you have in your inn’s armoire where you can store all your gear sets (as long as they’re fully repaired). Admittedly, I almost managed to fill all these slots. But this was easily rectified by selling all of the unneeded materials I’ve picked up to a vendor. 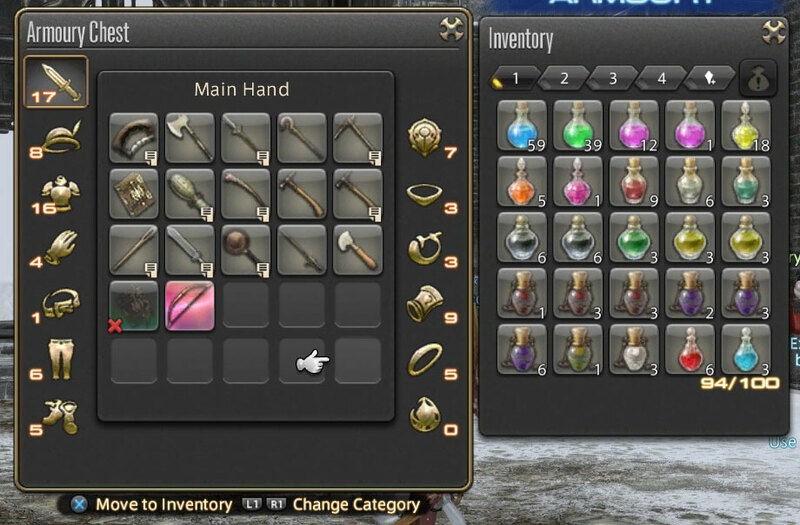 Between having 25 slots for each piece of weapon, armor, or accessory, and 4 pages of 25 slots for inventory, not including crystals and key items, which have their own set of slots, I’d say you have a pretty good amount of space for loot! 3. Public events are a common occurrence. FATEs or Full Active Time Events are, well, events that occur around the zone that are triggered by either the server or a player. You typically see them on the map as big bluish circles. Participating in a FATE is an easy way to get an understanding of your character’s abilities in lower levels, but is also a quick way to gain experience. Later in the game, you’ll be getting Grand Company Seals (another form of currency) for completing them. 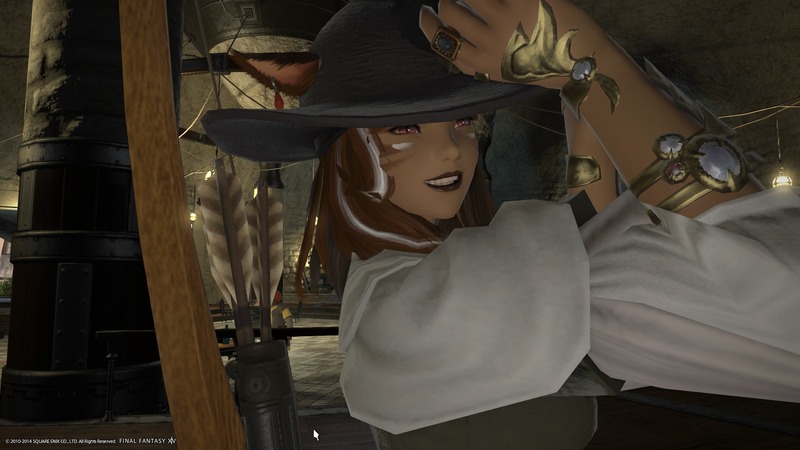 While public events aren’t by any means new to recent MMOs, Final Fantasy XIV: A Realm Reborn’s FATEs allow players, regardless of their level, to participate in any of these events. Because they hold a significance later in the game (Grand Company Seals), there is no reason why people would want to pass up on any of these happenings. Of course, this would require higher level players to do a Level Sync, which drops their stats to that of the highest tiered player level for that FATE, but everyone’s participation makes it feel like the world you’re in is a lot less lonely, given that the game has given people reason why helping other players is a good idea. FATEs are a good way to gain experience and seals in the game. 4. There’s a cheaper monthly payment option. We’re not talking about “prepay 3 or 6 months of service” here, but an option to pay $12.99 a month for a limited number of character slots. By default, players can pay the usual $14.99 a month and have a maximum of 8 characters per server with a total of 40 characters across any server. But if you’re only planning to have 1 character per server and have a total of 8 characters across all servers, you can drop your subscription down to $12.99 a month and keep it that way. Of course, if you’ve been playing since the original Final Fantasy XIV and have had a paid account for at least 90 days back then, you get the best deal of them all: $9.99 a month. Here’s some additional clarification on the payment plans available for players, straight from Mog Station, where you manage your subscription. 5. There are tons of callbacks from older Final Fantasy games. If you ever thought that you were the only one who thought that Ul’dah looked like Rabanastre from Final Fantasy XII or that the Galean Empire looks suspiciously like the Empire in Final Fantasy VI, you’re not the only one. Final Fantasy XIV: A Realm Reborn features a ton of callbacks from other Final Fantasy games that border from the obvious (Chocobos) to the subtle (“Blame yourself or god!”). Of course Chocobos would be in this game. 6. The end of 1.0 is part of the game’s storyline. 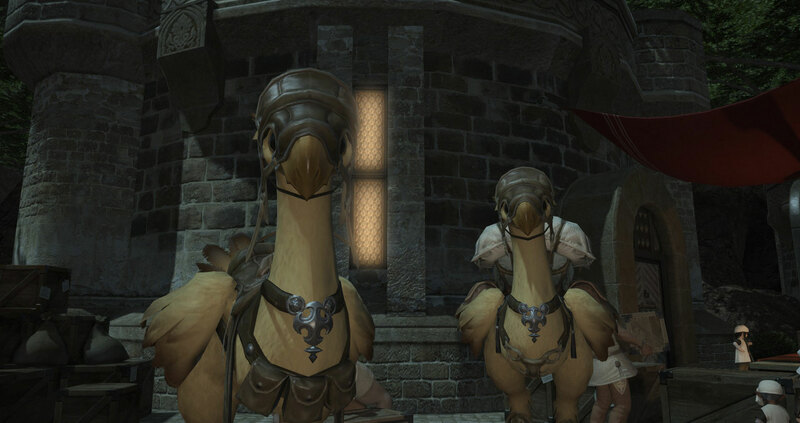 When Square Enix realized that 600,000 subscribers just ain’t going to cut it for Final Fantasy XIV, they decided to bring in a whole new team of people to try and resuscitate the ailing game. But that didn’t mean that they were just going to toss the original game’s story and create a new numbered online Final Fantasy. Instead, the new developers orchestrated the careful destruction of Eorzea, not entirely dissimilar to the events of World of Warcraft: Cataclysm. But that wasn’t enough, of course, as they created a CG cutscene that showed just how Eorzea got destroyed and how its armies at war were decimated in one fell swoop. 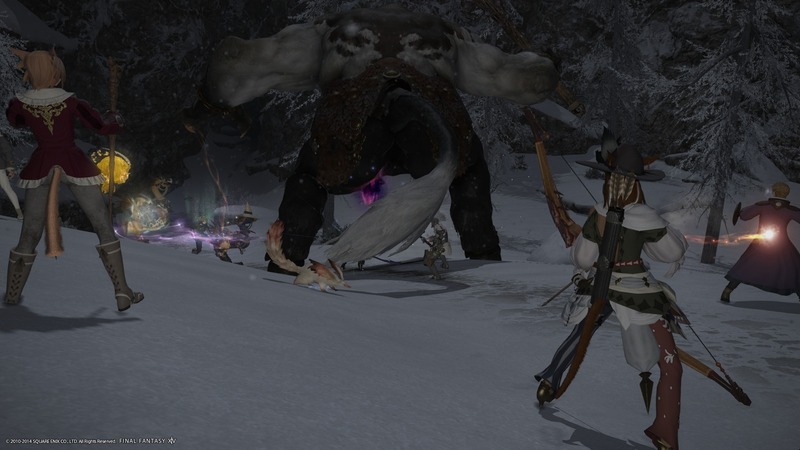 It was an ending that played as soon as the original Final Fantasy XIV’s servers were turned off, and players in every server were swept with the notion that Eorzea had been destroyed and they had absolutely no way to save it. This ending is now part of Final Fantasy XIV: A Realm Reborn’s title screen movie in its entirety, showing the destruction of Eorzea all the way up until its strange and somewhat peaceful reemergence five years later. The five years that passed is a mystery to both the world’s inhabitants and the players that inhabit it, setting the stage for a mystery that unravels over the course of the game’s story. 7. Armor and weapons being sold by vendors are actually useful, for a change. One of the early tutorials in the game will force you to actually get a full set of level 5 gear. 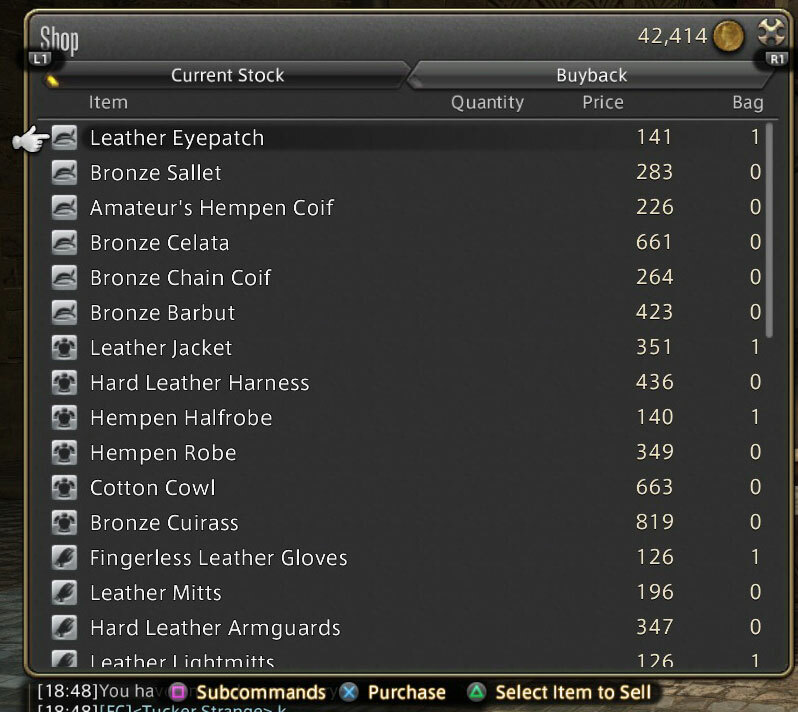 This isn’t a mistake: buying weapons and armor from vendors is actually a thing you can do. It’s true that you can get gear from quests, but one of the most sure fire ways in getting a full set of armor (that matches, for that matter) is by buying these from the vendors. Having played the game from beginning to its end, complete with credits rolling, I can safely say that buying armor and weapons from vendors is a good strategy if your main goal is mainly to see the game’s story through. While I relied on quest items to advance my gear, from time to time I’d just head to a vendor and complete my set. It’s that simple. 8. Guildhests, dungeons, and raid bosses are meaningful! One of the neat things that Final Fantasy XIV: A Realm Reborn does is how it safely coddles new players into the genre. Granted, I’ve played many MMOs before, but I was really surprised at how certain parts of the game are finely crafted towards teaching newcomers to the genre on basics that, at this point in time, are considered by many veterans as second nature. The player’s first exposure to dungeon-like activities are smaller events known as guildhests. Guildhests are small encounters that teach players what to look for in encounters and rewards them based on their survivability. The game provides a tool called the Duty Finder that takes your class’ role (tank, healer, DPS) and puts them in a queue containing other players that spans across servers in your server cluster. Once it fills the necessary roles, it tosses you all into an instance and the guildhest commences. Once these guildhests start, you are given a task with some advice from the guildhest’s battlewarden on what to look for in the battle in addition to what you should be mindful of. As you can imagine, the higher the guildhest’s required level, the more challenging the activities get. At some point during the game’s storyline, dungeons are introduced to the player. While dungeons have a 90 minute time limit, most dungeons can be completed in 30 minutes and can quickly be cleared by an experienced team of players. Partying up for dungeons is as easy as queueing up for the dungeon in the game’s Duty Finder and waiting until the next party begins. Shortly after, players are introduced to trials, which are basically raid bosses but stripped from actual dungeons. These battles are known to be a bit more strategic than the normal boss battles in dungeons, as they’re typically multi-tiered, and serve a specific storyline significance as well. Just like guildhests and dungeons, trials can be accessed via the Duty Finder. 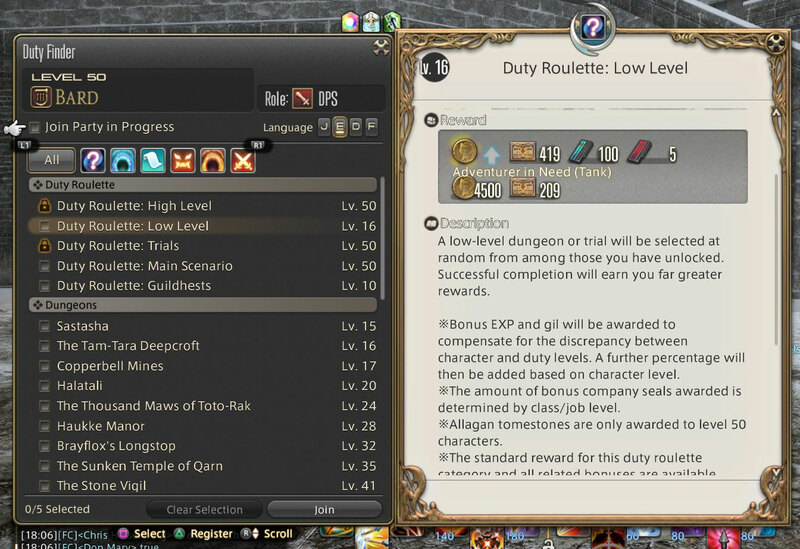 At higher levels, players are actually rewarded for participating in low level guildhests, dungeons, and trials and allow for a random roulette to be used, ensuring low level players are able to successfully complete the game’s main storyline thanks to players whose levels are maxed out. This, of course, has a benefit to higher level players as they are awarded tomes, another form of currency, that allows them to obtain end game gear. There’s of course the obvious benefit of gaining additional experience, which comes at a premium from levels 40-50, and gold. If a party encounters a party member who is new to the dungeon, everyone will get bonus experience should they complete the dungeon in a timely manner. Either way, everyone benefits from everyone’s assistance! The Duty Finder definitely makes things a lot easier to manage, anywhere, any time. And the bonuses are great incentives to do them regularly! 9. Changing your class is as easy as signing up for that guild and changing your weapon. One of the biggest innovations that Final Fantasy XI introduced is the ability of a character to learn every single job or class or crafting profession in the game. The player isn’t limited to one particular job and can, in fact, sign up for anything provided they can fulfill its initial requirements. Final Fantasy XIV: A Realm Reborn takes this concept and expands on it, allowing players to change classes on the fly just by changing their weapon. The game comes with the ability to save preset armor and weapon sets, which also allows for the ability to quickly change weapon and armor sets with the press of a button on the hotbar. Picking your current class or profession is just as easy as selecting your main hand weapon or choosing from your preset armor sets. 10. The game has an ending. There are few MMOs that claim to have some sort of finite end, but I feel that Final Fantasy XIV: A Realm Reborn definitely has one. When you begin your adventure, you feel that you’re slowly being embroiled in each of the nations’ struggles and begin to understand the challenges that each have to overcome. This is achieved by cutscenes that not only do a good job of explaining the events in the story, but also provide characters that the player can relate to in various ways. And believe me when I say that the conflict that Final Fantasy XIV: A Realm Reborn begins with will be addressed by the time the credits roll. This comes with a caveat, however. The game’s storyline is by no means finished. Similar to a game with a New Game+, the story continues with each subsequent patch. The promise of new classes, jobs, and locations ensure that there’s a lot of content to explore and discover post credits. During E3 2014, the developers mentioned that both the Rogue and Ninja classes were to be added as part of patch 2.4, with a tease for Shiva’s appearance coming in the future. 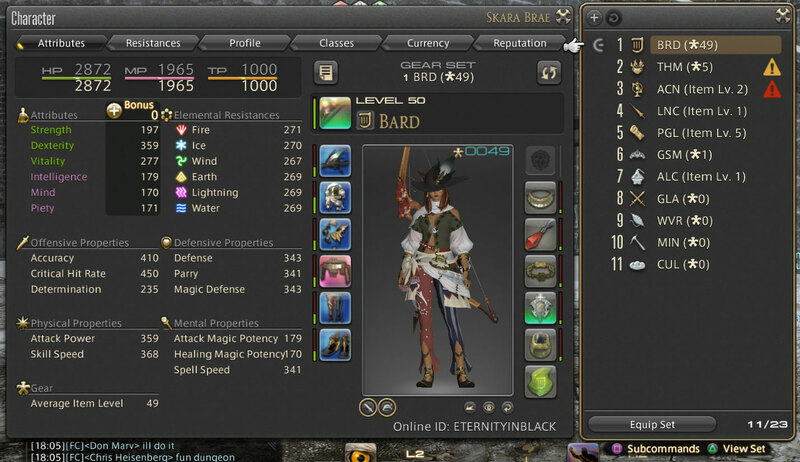 Needless to say, I’m still playing Final Fantasy XIV: A Realm Reborn as Skara Brae or Parthenia De’soto on Mateus. If you’ve ever had an inclination to play a MMO, I feel that this is a great way to start especially if you’re a fan of the series. No, I won’t link the ending video. Instead, you get to look at my pretty little Miqo’te, Skara Brae! I once joked around that Final Fantasy XIV: A Realm Reborn is the best Final Fantasy on the PS4, given that it’s the only one out right now. But I’m now more inclined to think that Final Fantasy XIV: A Realm Reborn is probably the best new Final Fantasy game I’ve played in recent memory, thanks to its memorable characters, epic storyline, and fun gameplay. And that complement, coming from someone who swore off MMOs many moons ago, is saying a lot.